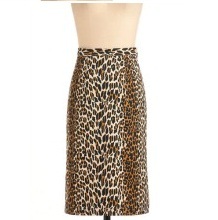 Just as you imagine Leopards outrunning each other as they race through the wind, you like to zip-and-button yourself into this safari-inspired skirt by Trashy Diva to get yourself in the mindset of accepting any workday challenge! Trashy Diva is a proud New Orleans company that draws inspiration from vintage pieces, and puts generous amounts of attention into updating their garments to assure a flattering, old-school feel that’s refreshed to fit the modern girl’s body. Their name is drawn from the idea that classic beauty can often sprout from sassy beauty, and with your noir turtle neck tucked into this side-slitted skirt, your sense of style and strong work ethic are clearly combined! With natural-toned pumps under the hem of this skirt, your coworkers will know to bring their A game the second they see you prowling toward your cubicle in this fierce Leopard print skirt! Sizes 6, 8, 10, 12, 14, 16, and 18 runs large. Fabric provides stretch. Unlined. Hidden zipper at side with button closure. Additional button. Pleats at sides are 6 inches in length.